Don’t go chasing waterfalls, TLC sang, but here at dealchecker we just can’t help ourselves. We can’t imagine anything dreamier than exploring gorgeous, often mountainous surrounds, to find clear, cascading waters. 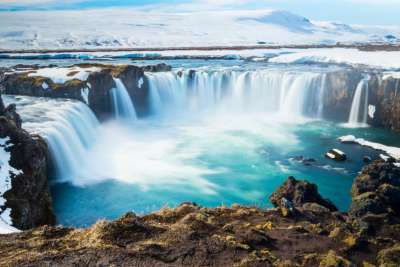 Here, we’ve rounded up the waterfalls that have us grasping for our passports and adding to our ever expanding travel bucket lists. 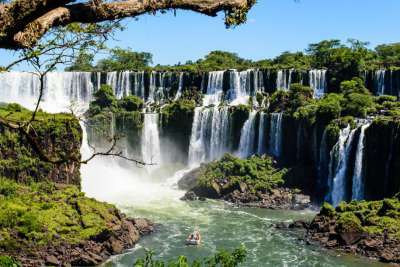 Straddling the border between Argentina and Brazil, amidst the verdant Atlantic Forest, lies the Iguazu Falls. You might imagine then that discovering these falls would involve a little searching, but that couldn't be further from the truth. The Iguazu Falls are vast, measuring in at two times the depth of Niagara and three times the width. The most photographed part of the falls lie at the Devil's Throat, a horseshoe formation of 14 thundering falls whose foaming pools create a mist that causes rainbows to form. 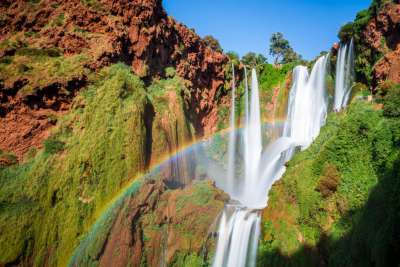 It's hard to imagine that just hours outside of the hustle and bustle of Marrakech, the Ouzoud Waterfalls meander their way down mountainsides, but that is indeed the case. These waterfalls sit high in the Atlas Mountains in a series of falls and pools in which to cool off after the long walk up. To explore them to their fullest we recommend hiring a tour guide and making the hike between the pools. You'll need sturdy shoes and you might work up a sweat, but the views afforded by this journey will make it more than worth it. The Turkish resort of Antalya is well-loved for its cocktail bars, restaurants and glamorous harbour, but just beyond the city limits there is a secluded pine forest where the Kurşunlu Waterfall trickles into a tranquil pool. The falls are most impressive in winter months when the rainfall is higher, and then you can often spot turtles swimming through the pools here. This is an idyllic spot for a picnic and we recommend packing food for lunch beside the falls. 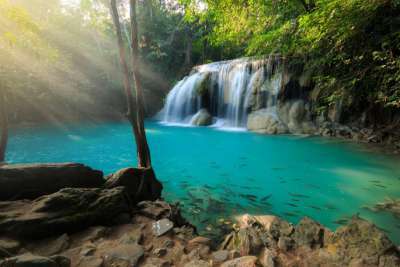 Brimming with turquoise waters, the Erawan Falls are a popular spot with travellers who flock to the Kanchanaburi region of Thailand specifically for experiencing this natural wonder. The falls lie in a number of tiers and each one comes replete with a pool where you can swim alongside the many fish who reside there. Once you're done splashing through cool clear waters, it's worth venturing out in to the surrounding national park. The number of trails is limited in this part of the Erawan National Park but for those who keep their eyes peeled, there is the opportunity to spot monitor lizards and macaques. Iceland's Gulfoss waterfall has a history that is nearly as dramatic as it is. Once upon a time, it was the subject of a huge family dispute as the family who owned it fought over whether the fall should be leased to an Englishman who wanted to start construction on the waterfall to harness electricity. As a result of this dispute, the waterfall was ultimately sold to the state and nowadays, visiting is easy - you can even grab lunch at the cafe here. In winter months, the falls creak to a halt as they freeze over with endless seeming ice waves making it a magnificent spot all year round. 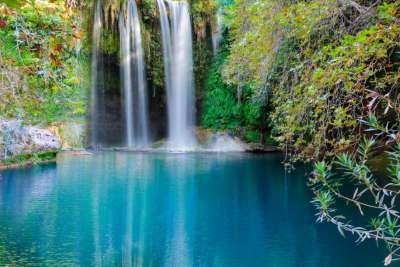 So far, we've looked at dreamy waterfalls in Asia, North America and in Europe's sunnier climes, but there are some real gems to be found much closer to home. Over in County Durham, High Force rushes through to the Durham Dales. This dramatic waterfall plunges 21 metres into the pool below, and is surrounded by dramatic rock formations and forests making it a great spot for a photo. 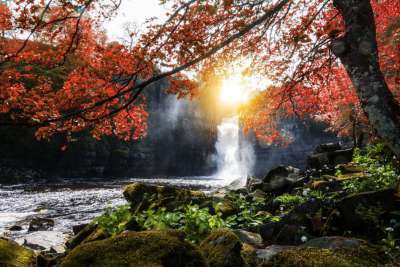 Those looking to explore the area might be tempted to go in search of the deer who live here, or enjoy a spot of fishing in the River Tees, where High Force resides. Hawaii is a holiday destination that dreams are made of with lush green scenery, and turquoise waters full of dancing dolphins. 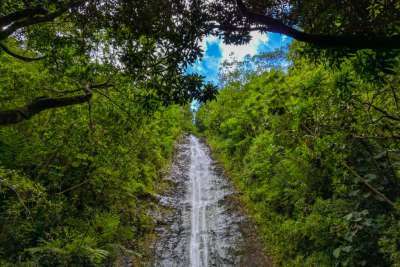 Just outside of the capital Honolulu, in a pocket of forest sits the Manoa Falls, providing an idyllic spot for those who want to combine their holiday with a spot of exercise. Jurassic Park lovers will enjoy the opportunity to hike through an area where scenes for the famous films were shot, and it's not hard to imagine that dinosaurs reside nearby in such verdant scenery. 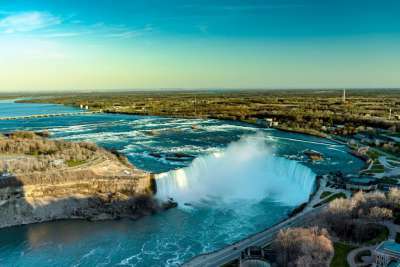 Niagara Falls are arguably the world's most famous waterfalls, their horseshoe formation is etched on to postcards and posters aplenty, but all with good reason. These thundering falls are vast and impressive, plunging 51 metres in to Lake Ontario below - the spray from this drop creates a constant mist. Perched on the border between the USA and Canada, the falls have captured the imaginations of those on both sides for decades. In the early 1900s, people flung themselves over the edge in barrels in a bid for fame and fortune. These days, you can have your adrenaline rush in relative safety as you choose to sail up to the falls or whizz over them in a helicopter. 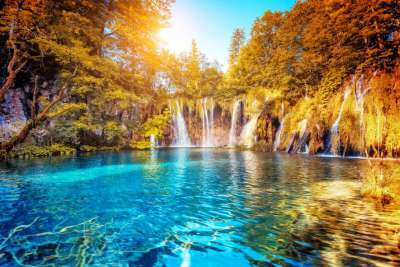 The Plitvice Lakes National Park is an almost ethereal spot with a series of bright blue lakes, fringed by lush fauna, sloping in to one another. In between these lakes, waterfalls trickle preventing the water from ever becoming stagnant. You could spend a whole day exploring the lakes, even walking around them on foot can take up to six hours. Those staying in the coastal town of Zadar can take the bus in land for a day spent frolicking in these beautiful surrounds. 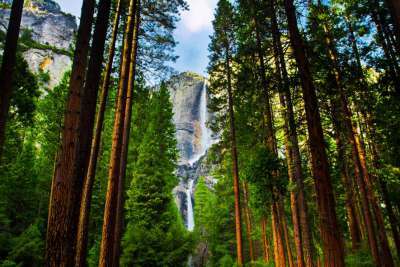 Yosemite National Park is famed for its looming giant sequoias and black bears, proving to be a popular spot with both hikers and campers alike who flock here to lose themselves in nature. The park is also home to North America's tallest waterfall, the Yosemite Fall. Here, three waterfalls run in to one another over a 2,400 feet drop before plunging in to a pool below. One of the oldest trails in the park takes you to the top of the falls affording you with incredible vistas out over the Sierra Nevada Mountains.